Simon Snow just wants to relax and savour his last year at the Watford School of Magicks, but no one will let him. His girlfriend broke up with him, his best friend is a pest and his mentor keeps trying to hide him away in the mountains where maybe he'll be safe. Simon can't even enjoy the fact that his room-mate and longtime nemesis is missing, because he can't stop worrying about the evil git. Plus there are ghosts. And vampires. And actual evil things trying to shut Simon down. When you're the most powerful magician the world has ever known, you never get to relax and savour anything. 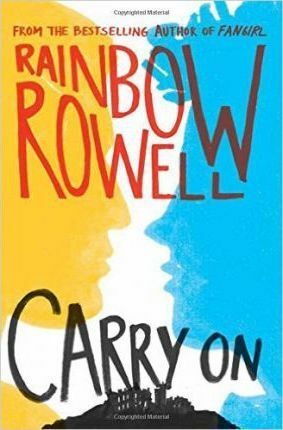 Based on the characters Simon and Baz who featured in Rainbow Rowell's bestselling novel Fangirl, Carry On is a ghost story, a love story, a mystery and a melodrama. It has just as much kissing and talking as you'd expect from a Rainbow Rowell story - but far, far more monsters. Rainbow Rowell lives in Omaha, Nebraska. FANGIRL is her second YA novel and a New York Times bestseller, as is her first novel, ELEANOR AND PARK.